Don't rent the cheap light weight splitters you will spend twice as much time as with this unit!!! For those who require peak power and performance, this is the perfect choice! ALWAYS WEAR PROTECTIVE GEAR WHEN USING UNIT!!! 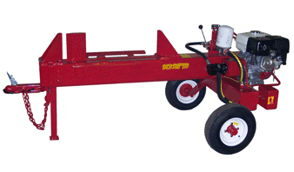 An absolute no nonsense splitter is designed to work continuously without failure splitting the hardest density hard woods up to 48 in diameter while boasting a full cycle time of only 13 seconds, reinforced stops and frictionless Ultra-High-Molecular-Weight polyethylene sliders making them the most rugged, longest lasting log splitters available on the market today. Please call us for any questions on our log splitter heavy duty in Clearwater FL, Tampa, St. Petersburg, and West Pasco County, Pinellas County, and Hillsborough County.